Side chair. Walnut primary wood and maple secondary. Yoke-shaped crest rail with central carved shell. Cyma-curved stiles and vasiform splat. Compass seat upholstered with twentieth-century red stamped worsted fabric; cabriole legs feature high-relief shell carvings terminating in carved bellflower drops; turned swelled stretchers with blocks and ring turnings, claw and ball feet. 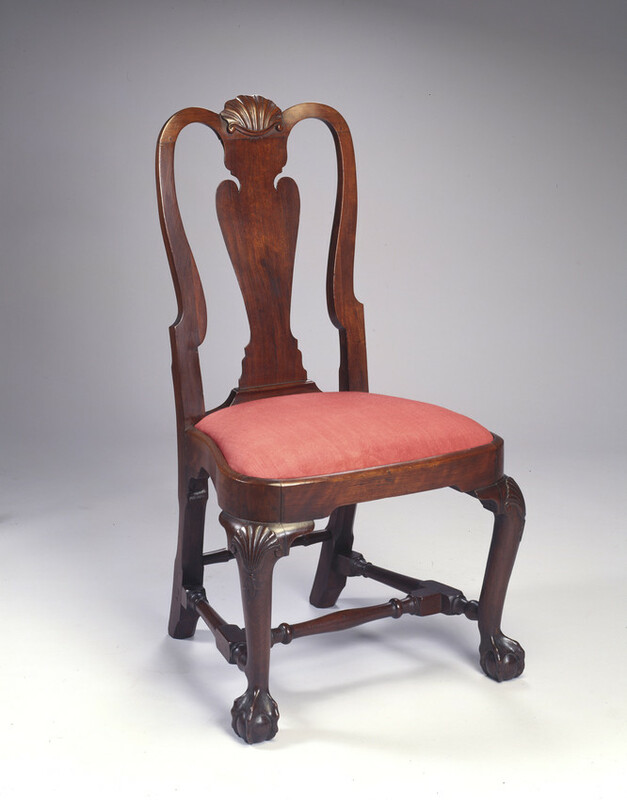 Part of a set purchased by Charles Barrett, Sr.
"Cherished Possessions": This chair represents the height of style in colonial America, as close to the English model as it was possible to get. More expensive versions were available-chairs that had slightly more elaborate stiles; or that used flashy walnut veneers on the back splat; or that had more carving-but this was still the gold standard. Because this chair has the roman numeral VIII stamped into its seat rail, we know it was originally part of a set of at least eight. The set belonged to Charles Barrett, Sr., (1740-1808) of New Ipswich, New Hampshire, who probably inherited it or purchased it used around the time of his marriage in 1764.